DFW Printing offers premium Dallas and Fort Worth menu printing for all kinds of dine-in and take-out menus with a variety of sizes, materials, finishes and folds. We work with only the finest materials, and use a cutting-edge production process that can whip up any menu creation that you fancy. Whether you need thousands of folded take-out menus or just a dozen laminated dine-in menus, we’re the right team for the job. Options are diverse. For example, full color menus are popular in various finishes, such as glossy UV coating and slick matte finishes. We also maintain a large range of quality paper and cardstock providing various ranges of durability and color reproduction. Whatever you choose, rest assured that all DFW printed restaurant menus will look and feel really good in the hands of your customers. To begin the process, you need a design. If you have already made your design, reach out through the contact form to send online, or else bring your completed designs into our shop for menu printing. If you haven’t yet made a design and need assistance, let us know and our designers will work with you to bring your menu ideas to life. Our design services are top notch! Experienced restaurant owners know that printed menus serve as the first impression of what a restaurant has to offer. In restaurants where ambiance and service are features, customers are certain to spend a lot of time poring over the menu in great detail. It is very important to get this right, before the restaurant menu printing begins. DFW Printing can help ensure that you make the right impression when customers scrutinize your menu. 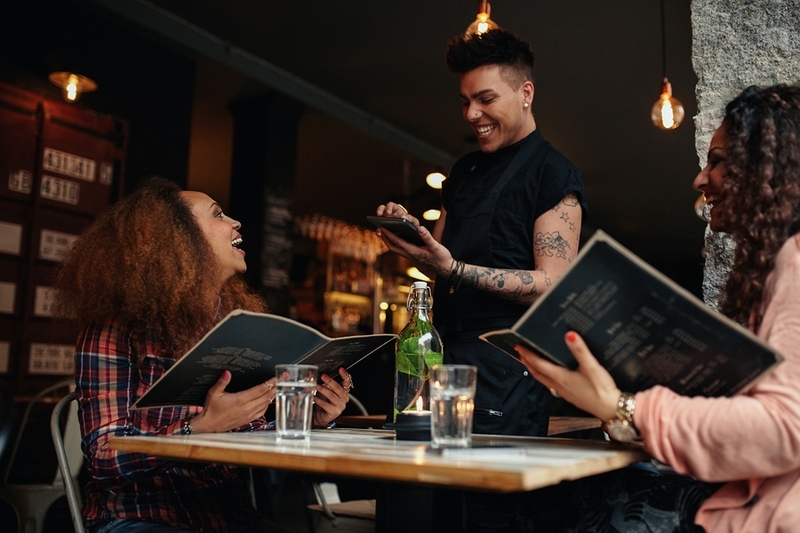 Make sure to use that opportunity to highlight not only your restaurant’s food and drink offerings, but also it’s driving dynamic. Take-away menus offer all sorts of opportunities to widen the reach of your marketing message. Keeping in mind that many customers will bring takeout menus to their home or office, it’s a great space to add coupons or special offers. Also, it is common for customers to take more than one menu to share with their friends or coworkers. Consider printing menus for just this purpose, and then help your local branding penetrate beyond your storefront. In conclusion, restaurants can maximize advertising and promotion with their take-out menus. 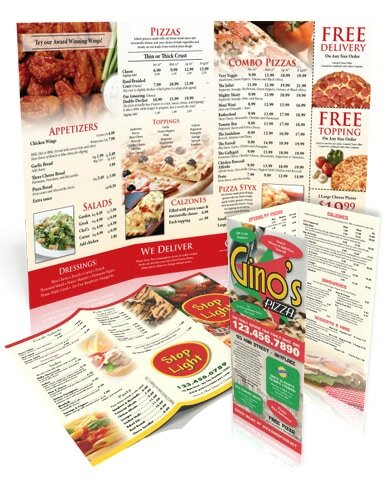 DFW Printing’s most popular take-out menus are printed on high quality paper in a choice of tri-fold of flat design. These are convenient, portable and easily distributed by your satisfied customers. Whether you need pizza, Chinese or Italian restaurant take out menus, or perhaps take-out menus for a cafe or bakery, let DFW handle all your takeout menu printing and design requirements in Dallas and Fort Worth. For a take-out menu printing quote, use the form below! We offer custom printed dine in menus, that are laminated and will help you outline your awesome food and beverages. A dine-in menu represents your whole restaurant itself, and it is what your customers chooses of, so it is very important to get it right. If your menu is well designed it will show the theme and the history of your restaurant while still showing its cuisine. But your dine in menu is much more than just a few piece of paper with your offered food on it, if designed right it a marketing tool. If your menu is designed right and it is accurately showcasing your restaurants theme then it will make it thrive! But designing a dine in menu is a hard task and it requires a professional. That is where we come in play! We offer custom dine-in menu printing and design in Dallas. We print in a lot of sizes from small to large format and we are very flexible when it comes to custom requests! Let us print and design your menu! Contact us by using the contact form on the left.